LT Game Ltd, a Macau-based provider of electronic gaming equipment and management technology for casinos, is displaying at the MGS Entertainment Show 2018 more than 20 slot game titles it says are already approved by Macau’s gaming regulator. The slot game titles have been developed primarily by LT Game via its Macau and United States subsidiaries, as well as through its Japanese partner, LT Game Japan. So said Jay Chun, chairman and managing director of LT Game’s parent Paradise Entertainment Ltd, in an interview with GGRAsia prior to the MGS Entertainment Show, scheduled to run from November 13 to 15 at the Venetian Macao Resort-Hotel. Slot games is a relatively new segment to LT Game. The brand is probably best known for Live Multi Game products – a category of electronic table game (ETG) product popular with Asian players, that features electronic betting and bet settlement, but with a live dealer. Mr Chun is also chairman of the Macau Gaming Equipment Manufacturers’ Association, the main organiser of the MGS-branded event. The gathering started out as the Macao Gaming Show, a casino trade show and conference, but has since had its name shortened to MGS and had expanded its exhibitor roster to include other technology and non-gaming services for the gaming and hospitality industries. LT Game has been developing slot products for “almost three years”, Mr Chun told GGRAsia. “Our eventual goal is mainly three markets – Macau, Australia and United States,” regarding sale of the products, the Paradise Entertainment boss told us. “We have three main development teams – one is based in Macau, one is in Las Vegas and another one is in Japan. So you will see three distinct styles there from our [slot] products. The Japanese ones contain more cartoon themes; the American ones have got very vibrant colours in their graphics for the slots; and those from Macau will carry more Chinese motifs,” Mr Chun told us. LT Game has a minority holding in a Tokyo-based business called LT Game Japan, which develops slot titles that targeting the Macau and Southeast Asian markets, Mr Chun noted. “For some of their [slot] titles, they [LT Game Japan] have collaborated with Namco, which specialises in cartoons and animations and has licensed some of its popular cartoon content, such as Tekken, to the slots. This is a direction that we feel can bring on an advantage that appeal to Asian players,” Mr Chun said. Japan’s Namco Ltd was renamed Bandai Namco Amusement Inc earlier this year, after a corporate rejig. “Sales [of slot products] can only be realised within the first half of 2019. And I hope that we can sell at least 100 [slot] machines per month,” Mr Chun added, referring to worldwide sales. He noted the slot products would undergo trial operations prior to formal market launch. The Paradise Entertainment chairman said diversifying into the slot machine segment was due to the firm’s confidence in the prospects of the mass-market gambling segment, especially in the Macau market. “ETGs are of course still our key products, but the reason we’ve begun developing slot products…is because the trend in Macau, in my view, is that the mass segment will definitely expand in its proportion,” Mr Chun said, referring to the local market’s overall earnings from gaming. “For the mass segment, there is a table cap policy [in Macau] that limits the deployment of gaming tables… and just as elsewhere that has a developed gaming industry, there are rising labour costs which will eventually result in a raising of minimum bets,” Mr Chun added, referring to traditional live-dealer tables. The Paradise Entertainment boss also said he was aware of the keen competition in the slot segment in LT Game’s home market of Macau, but was “not worried”. 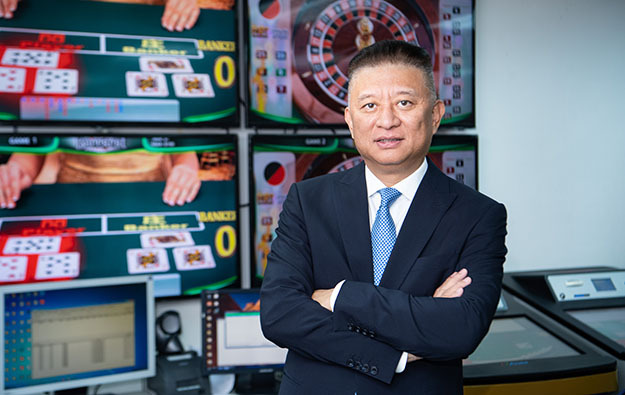 Regarding LT Game’s Live Multi Game product line, Mr Chun said that the firm had not introduced many changes to the content of the games, but had been upgrading the operating software and hardware of the machines, to comply with a technical guideline for such products issued by the Macau gaming regulator, the Gaming Inspection and Coordination Bureau, also known as DICJ. “For this year, we have some approved products that are ready for sale,” he said referring to receiving relevant go-ahead from Macau’s gaming bureau. They were: “‘Personal Dice’, which will be displayed in MGS Entertainment Show; and also ‘Multi Roulette”, which has four wheels that can be played together,” Mr Chun told us. The Personal Dice product enables individual players to take part in sic bo games via a standalone game terminal. Multi Roulette allows players to place bets – via a touch screen terminal – on four roulette games in one go. The game results are generated by actual – rather than virtual – automated roulette wheels. At MGS Entertainment Show, LT Game is also displaying a Macau gaming regulator-approved virtual horse racing betting product. It was developed with South African firm Kiron Interactive, and is ready for sale in the local market, according to Mr Chun. A separate virtual horse racing product – said to have been developed by LT Game in collaboration with Inspired Gaming (UK) Ltd – is “being tested”, with the aim of launching it later in Macau and the U.S., he added. Mr Chun mentioned to GGRAsia a plan to rebrand his firm’s cash handling products as “LT Digital”. The range would include “ATMs, currency exchange [kiosks] and cash redemption machines,” Mr Chun told us. “In terms of equipment, we have two divisions intended for the future – one is gaming-related, which we call LT Game,” Mr Chun said. An example of the product under the brand LT Game was the “Intelligent Card Shoe”, which Mr Chun said is compatible with “any cards”, and has already been sold to some casinos in the U.S..
“For the non-gaming products, we have the virtual bikes which is an interesting leisure product for gyms or people that want to contest with their friends, and at the same time they can do [online] chat in this game. This will be our first product to be branded under LT Sport,” Mr Chun noted, adding that about US$2 million (HK$15.7 million) had been invested in developing the virtual bike product. An upgraded version of the virtual bike product will be displayed alongside LT Game’s gaming products at the MGS Entertainment Show.